• Parental Permission. When transporting kids, a sign-off from their parents and guardians can help limit your potential liability. And since parents want to send their kids with organized and thoughtful people, it’s a good idea to attach trip details to your parental permission form. For multi-day excursions, you might also want to hold a parents’ meeting in advance to answer questions and allay any concerns. • Medical Emergency. If a member of your group needs to be taken to an emergency room or admitted to a hospital during the trip, this form gives you the authority to quickly address a health crisis. Though seldom used, it can help expedite treatment if the need arises. • Health History. Likewise, the quicker physicians and other healthcare providers can decide on a course of action in a medical emergency, the better. This form is designed to give medical personnel essential information about the health of each group member. When conditions such as diabetes, heart problems, seizures, allergies, and others are known upfront, it can lead to faster and more effective diagnosis and treatment. • Participant Agreement. Often used for teen and youth trips, this form sets rules and expectations for behavior (i.e., respect, drug or alcohol usage, etc. ), as well as the consequences for misbehavior. If a member of your group gets out of hand and needs to be sent home, this form ensures that he or she understood and agreed to those consequences in advance. 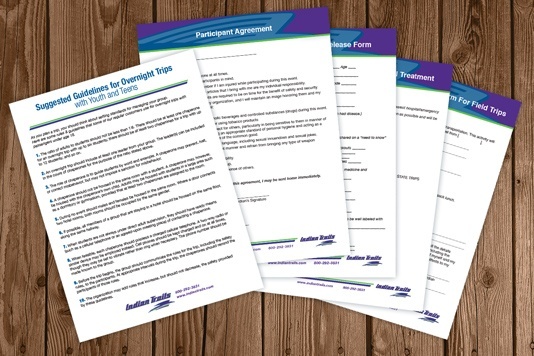 To make it easy for your group to use these forms and guidelines, we’ve bundled them together for download here. Mid-Size Coaches: You Asked. We Delivered. When Kirby Schoen hits the road as sales and marketing director for Indian Trails, it’s usually in his own vehicle. 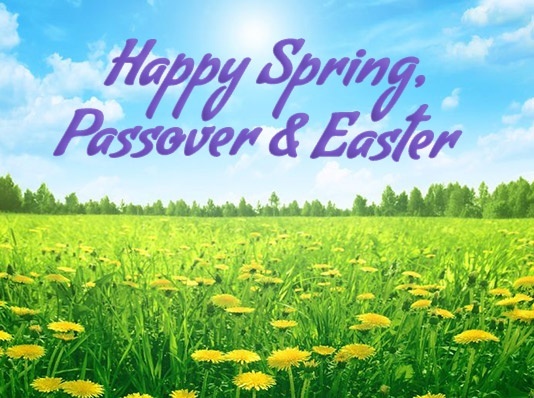 But recently he took a four-day trip across Lower Michigan in one of our new Temsa motorcoaches, introducing it to charter customers like you. 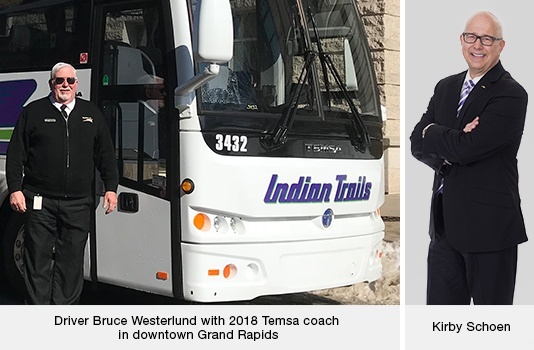 The addition of four mid-size, 34-passenger coaches to Indian Trails’ charter fleet was the result of an in-depth analysis of customer requests. We found that many wanted coaches that could carry smaller groups on longer trips. They wanted coaches with most of the same amenities as our full-size 56-passenger models. Mid-size coaches are also desirable to tour operators who may not be able to fill a large coach to capacity for trips to certain destinations, he adds, especially since smaller coaches also offer operational cost-savings that can be passed along to their tourist clientele. The new buses arrived in mid-December, and were ready to roll by early January. The response was immediate and positive. “We’re already booked for March and April,” says Kirby. One aspect of Indian Trails that stands out from other charter bus companies is a fleet that’s newer and larger. The new mid-size coaches, like their larger siblings, are equipped with state-of-the-art features such as charging outlets for electronic devices, DVD players with color monitors, reclining seats, individual climate controls and reading lights, cup holders, overhead parcel racks, a wireless public address system, and plenty of room below deck to store luggage. Each new Temsa is equipped with two kinds of advanced GPS technology—one for efficient navigation, the other to enable us to track the vehicle’s exact location at any time. 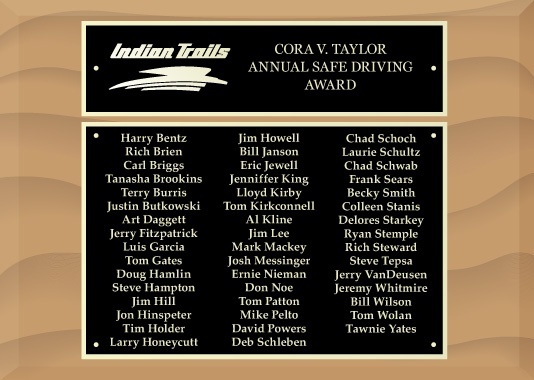 Each year, Indian Trails honors those who’ve piloted our motorcoaches for the entire calendar year without a preventable accident. 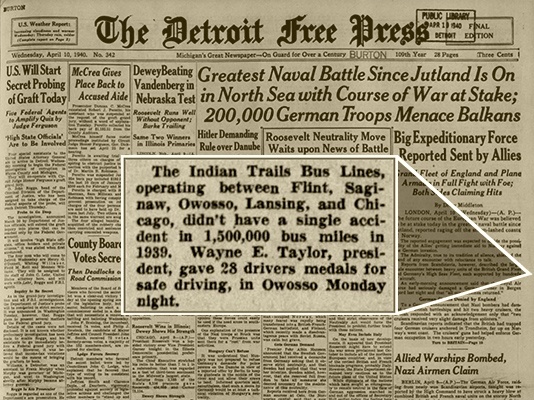 It’s part of our company’s “culture of safety,” which goes back to well before April 1940 when, as reported by the Detroit Free Press, co-founder Wayne E. Taylor gave 28 drivers medals for safe driving. Their names have been added to permanent plaques on display at each Indian Trails location, and all have received a gift card in appreciation for their accomplishments. Several of these drivers are also among the 29 we’ve honored with a “Million-Mile Safe Driver Award” since 1989 for going the distance without an accident. Many have served as instructors for new drivers, teaching best practices in defensive driving and maneuvering a 56-passenger motorcoach. Much of our drivers’ enviable track record of success flows from our longstanding, six-week intensive training program. It’s mandatory for all new Indian Trails drivers—even those who’ve come to us with years of experience at other transportation companies. 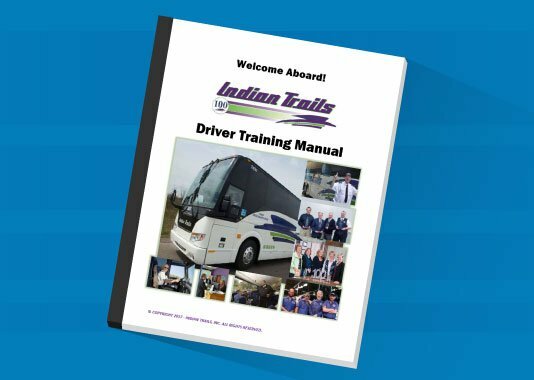 Indian Trails’ driver training curriculum—developed over many decades—is similar to the extensive training requirements that will be enforced by the Federal Motor Carrier Safety Administration (FMCSA) for commercial vehicle drivers nationwide in 2020. That’s no coincidence. We literally helped “write the book” on safe driving—i.e., FMCSA’s original “Model Curriculum for Training Motorcoach Drivers”—in 1995. However, compliance with that curriculum was voluntary. So, while FMCSA regulates all registered commercial motor vehicles that operate interstate or carry hazardous materials, many drivers at other companies continue to get behind the wheel without benefit of a formal driver training course. Essentially, they will continue to receive “on the job training” until the 2020 mandates take effect, no matter how risky that may sound. As of December 2016, according to USDOT’s Bureau of Transportation Statistics, 524,000 interstate motor carriers had 5.9 million drivers operating 264 million registered commercial vehicles on U.S. roads. How many of them lack training is anyone’s guess. Do Driver Training Programs Save Lives? “Duh,” one might say, since the answer seems as plain as day. But the lack of solid data to prove it was a big reason why a federal mandatory driver training course has been 35 years in the making. Another 10 years of rule-making, legislation, and court battles ensued over what type of driver training should be required and how it should be delivered. When FMCSA proposed driver training rules in 2007, it drew criticism from nearly all major players in the transportation industry. How much would compliance cost motor carriers? Should there be a driver accreditation process? Would a training requirement reduce the supply of new drivers? Where was the data showing a “safety benefit” from driver training? Etc. How much better? On average, drivers who receive some formal training of some kind have one-third fewer crashes than drivers who don’t.